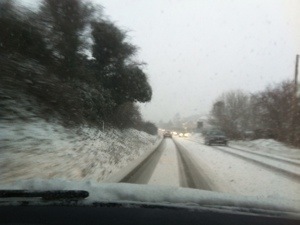 Just like hundreds of others I got stuck in the freak March snow in the south of England this evening. It may not look that impressive, but five hours to do 20 miles wasn’t my kind of fun. Especially when I left work at 5pm for a change. And don’t mention needing to pee! No gritting (that anyone had seen), no winter tyres and lots of people with no concept of how to drive on ice. 4 people span in front of me, and so many bent cars at the side of the road. Proof that we’re not cut out for this weather. Although the guys pushing cars up the hill were brilliant.